As an old radical Democrat, I remained fearful that this fall would see another 2000 and 2004. But instead there was a massive shift of perhaps 10 million votes, or about 7 percent to the Democratic side. 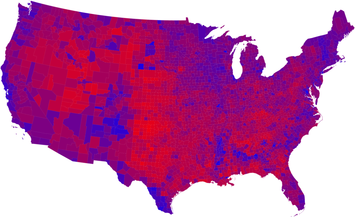 Yet in some ways the “red” and “blue” map of results doesn’t look very different than in the past – a vast interior sea of red, although close inspection reveals some important shifts from red to blue. But the second map, of change – 2008 compared to 2004, is astounding: now a sea of blue across the North and West (except for the Arizona due home state effect). There was also a fascinating (Bible?) belt of counties that became redder than in 2004, if that were possible, from Appalachia, the southwest tip of PA, through WV, TN and northern AL, then west across the border South through TN, AR, ands OK. The 2008 election clearly reinforced and amplified some trends already apparent in 2006, a Democratic ascendancy based first in large metropolitan areas, but now extending far into suburbia and even exurbia, and dominated by an intellectual and professional class, and second, traditional racial and ethnic minority areas, urban or rural. Now these are joined by a third group, a dramatically larger Obama vote from the under thirty, and probably enough to have shifted several critical states - CO, IN, IA, NH, NC and VA – the Democrats. The three groups overlap, of course. Except in those anomalous border states, the relative shift was about the same in rural small-town America as in the large metropolitan areas. However, the turnout certainly increased more for minorities and for the under-30 than for us white non-Hispanic adults. Frankly, along with other political geography experts, I underestimated the likelihood of the shift to the Democrats of VA, NC and IN. There are some fascinating details. First is the amazing success of Obama in counties dominated by colleges and universities, with switches in strongly Republican Whitman county in Washington (home of Washington State), or Gallatin, MT (Montana State, Bozeman) and Monongalia (Univ. West Virginia), or Tippecanoe (Purdue University), IN, and dozens of others. Second is the shift of many metropolitan core, suburban and exurban counties to Obama, including in California Ventura, San Bernardino, Riverside and San Diego (truly amazing), as well as Reno (Washoe), NV; Orlando (Orange), FL; Houston (Harris); TX; Birmingham, AL; and Raleigh, NC. Perhaps the most unusual were the switch of very long time Republican strongholds as Omaha NE, Cincinnati, OH, and Grand Rapids, MI. Third, Democrats also continued to carry even more counties with environmental in-migration, especially in the west. We may have seen a historic shift from the baby-boomer generation to a newer Millennial generation. But the Democrats should remember from 1994 that the American electorate is centrist, and any supposed realignment is fragile. Submitted by wendylowhy on Tue, 10/08/2013 - 02:23. Submitted by gww99 on Wed, 11/12/2008 - 08:30. Although I will never see a government that meets my preferences as a classical liberal, I hope the next four or eight years bring economic prosperity and international peace. I doubt that it will. While voters do tend to continue voting the same way most of their lives, as you point out, the voting public is centrist. No long term conclusions can be made from this election. Obama et al do not have to keep all of their impossible promises, but they do have to do better than the last three months in American economic history and better than 2003 to 2006 in foreign policy. It will be a tough task, and voters will be patient to a point, but that point ends in 2010. Submitted by davebarnes on Tue, 11/11/2008 - 17:54.
crackers (a poor white person living in some rural parts of the southeastern U.S.). And, that will be the death of the GOP as crackers don't have the money that country-club Republicans do.